John McCain came out swinging with comments about the U.S. economy that he says is “bleeding” and you might be surprised at who he’s holding responsible. At the heart of the massive problems with the economy, says McCain, is the Federal Reserve, the collective Obama Administration and wait for it… JPMorgan Chase CEO Jamie Dimon. And make no mistake – he’s not mincing his words. 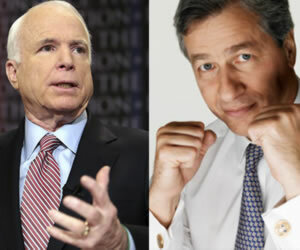 The one time presidential hopeful, John McCain went on attack and his first target was Jamie Dimon, who, he says is whining about entirely too much these days, “I don’t owe Mr. Dimon anything,” McCain said. Mr. Dimon has done very well as have major financial institutions, and the American people are very unhappy and dissatisfied with it, as they should be. He then went on to say the first mistake the fed, Obama and Dimon made was putting Wall Street ahead of Main Street both during the recession and financial crisis and even today. But it was his comments about Dimon that have us holding our breath. As we know, Dimon’s one who believes if it’s on his mind, it’s on his tongue – and it’s just a matter of time before he strikes back after McCain found it incredulous that Dimon would say he did the Fed a “favor” when Chase bought out Bear Stearns in 2008. Of course, there’s now a massive lawsuit by New York against JPMorgan Chase. When it bought out Stearns, it bought the legal repercussions as well. Dimon has had his own incredulous position about why it’s coming back to haunt him now when he says he told the government he nor Chase wanted anything to do with Bear Stearns. Dimon insists he was simply doing the government a favor. As we know, Dimon is quite vocal on things he disagrees with, including everything from the Dodd Frank reform bill to the insistence by Congress that he testify about the whopping loss his bank took last spring over mortgage securities. I’d have to think about it…But I’m very unhappy with his performance and what’s happened to the economy when he’s announced all these measures and all the easy money. Who gets the benefit of the easy money? The big businesses on Wall Street. We’ve gone from a $10 trillion debt to a $16 trillion debt – a $51,000 debt for every man, woman, and child in America. That’s not acceptable. McCain is actually putting a voice to millions of Americans’ fears, fears that are heightened because of two big events looming: the presidential election and the upcoming fiscal cliff, which, still has yet to be resolved, even as Congress knows the date looms. McCain is clearly the voice of reason at this point in the game and frankly, many are voicing their surprise that he chose CNBC to exercise that voice. McCain is Republican and the media, over the past several years, has become divided – there are those networks that lean left and there are those, or rather one, network that tends to lean right, which is Fox News. We need to sit down all of us with our president and say, this is our deficit, this is our goal, here is the period of time that we have in order to fix it and here are the measures that have to be on the table. Whether we agree or disagree on the measures needed. We’ve got to stop the bleeding, and that means putting everything on the table. He then went on to say that ethanol production subsidies are an “insult to everybody’s intelligence” and that the country provides so many tax breaks for special interest groups that it’s annihilated the tax code. If you just simplify the tax code then you work on getting increased revenues. And if he is the voice of reason, then there are plenty of experts who share that same voice. There are growing worries over the fiscal cliff, which mean an end to the Bush era tax cuts along with huge spending cuts that jeopardize much-needed programs. The managing director at International Monetary Fund, Zhu Min, said last week that these concerns are global and are a threat to the world economy. The problem of course can be summed up in one word: Congress. Lawmakers on both sides haven’t even tried to reach an agreement, despite the almost certainty of a deeper and far more devastating recession that will surely result in the loss of at least two million jobs. This, according to the Congressional Budget Office, is finding its way front and center – even ahead of the presidential elections that will take place in less than one month. The second of three presidential debates will occur on Tuesday night; though based on the thoughts following the first one, few are hopeful this second one will shed any light on who might ultimately be the best choice for president. If the fiscal cliff comes full circle, every small step forward over the past two years will fall to the wayside. Credit card companies are just now beginning to move forward while loosening their approval processes, the housing market looks stronger and Americans are finally beginning to pick up the pieces. Granted, there is still much, much more work to do – especially when it comes to the employment numbers. But it’s better than what it was a year ago. The lack of Congress to fix this before it becomes a crisis is unforgivable and the American people, albeit relatively quiet for now, will have much to say should it happen. McCain, for his part, insists an agreement can be reached. We all know we’re facing a fiscal cliff. Everybody knows we have to fix it. The problem is nobody knows exactly how…I have every hope that we can sit down and reach an agreement.